Dozens of extremist Jewish settlers, early Thursday, stormed the compounds of the Al-Aqsa Mosque in military occupied Jerusalem, Palestinian sources reported. 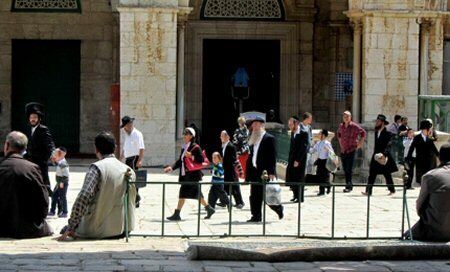 The General Director of the Islamic Awqaf and Al-Aqsa Affairs, Sheikh Azzam Al-Khatib said that dozens of Jewish settlers stormed the mosque through al-Magharebah Gate, under heavy protection of Israeli special forces and police. Extremist settlers toured the Al-Aqsa yards, and performed their provocative Talmudic rituals causing a state of tension and anger inside the shrine, Al-Khatib added, according to Al Ray.